I hate to perpetuate the stereotype that vegetarians eat nothing but lettuce, because honestly the variety of non-lettuce-based meatless dishes is endless. 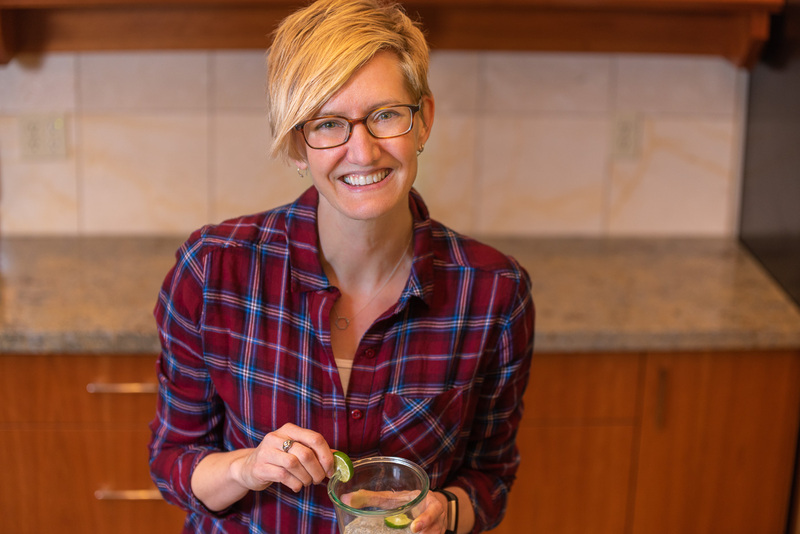 Really and truly most of our meals are built on substantial, hearty foods like grains (quinoa or pasta), legumes (lentils or garbanzo beans), soy foods (tofu or tempeh) and not simply crunchy, watery leaves. But because it’s August, because it’s been warm and sunny, and because I haven’t felt much like cooking, we’ve been relying on salads for dinner more than usual. There are 5 in particular that were colorful, flavorful, satisfying, and memorable enough to blog about. All of them also hold up well overnight (without dressing) so they made for easy leftover lunches the next day. I say do a bunch of chopping once, get two meals out of it. Boom. Done. Efficient. You’re probably thinking, “What a strange collection of foods in one salad.” And you’d be right, but man it works. The combo is inspired and the bright colors make it especially appealing to my eye. 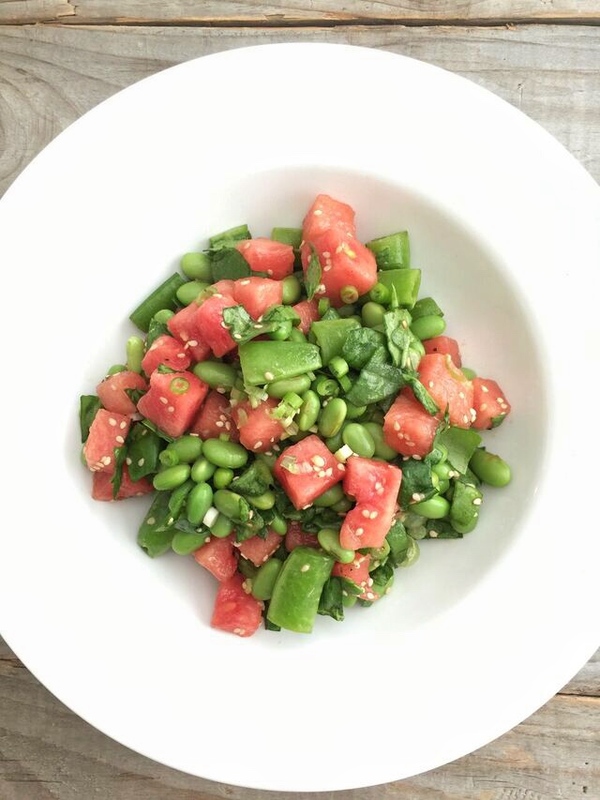 The edamame provide some substantial protein and it’s a creative way to get both fruit and vegetables in one salad. 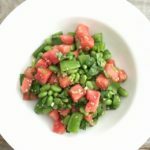 This salad has been a favorite summer stand-by since it was first published on the 101 Cookbooks blog in 2009. 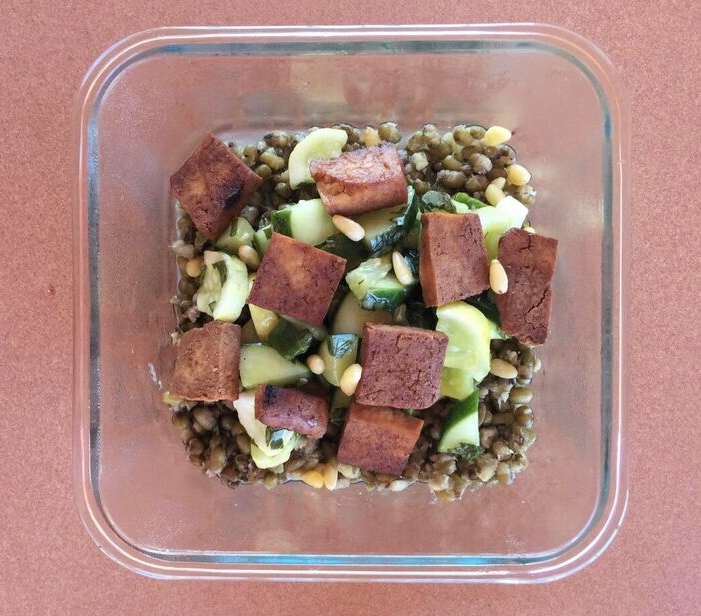 Again, you might be skeptical that tofu, mung beans, cucumbers, pine nuts, and basil can taste good together but it is a winning combination. I was quite satisfied to have it for lunch the next day at work, which explains the weird pink table and lack of food styling props. I opted to photograph my meal in its natural habitat instead of my typical fancy photo shoot set-up…on my living room floor. I replace the dill with basil just because it’s my preferred herb. The salad works well with regular cucumbers if you can’t get the cute yellow lemon variety. My husband tells me it’s fantastic with avocado as the original recipe instructs, but I opt out because of texture issues. The recipe instructs you to cook the tofu in a dry pan with salt, which works dandy. I prefer to use my Salty Baked Tofu Bites for more flavorful squares, but either would serve you well. This was shockingly delicious and so simple. It was more of a side salad than a main dish so we had it one evening alongside cheese pizza. 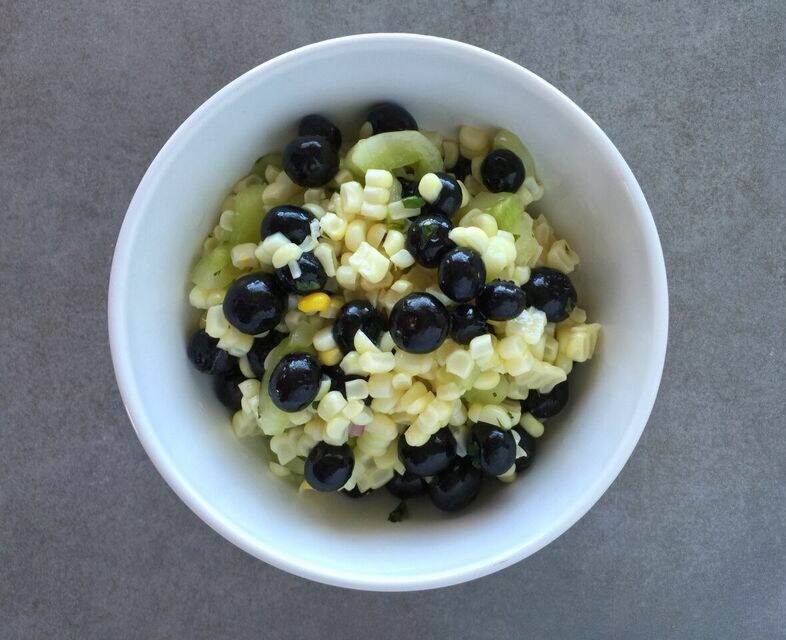 Again, the fruit and vegetable pairing is ingenious, all tossed together with a lime honey dressing. For a summer evening it was cool and refreshing. This beauty is originally from Cooking Light magazine, from 2001. 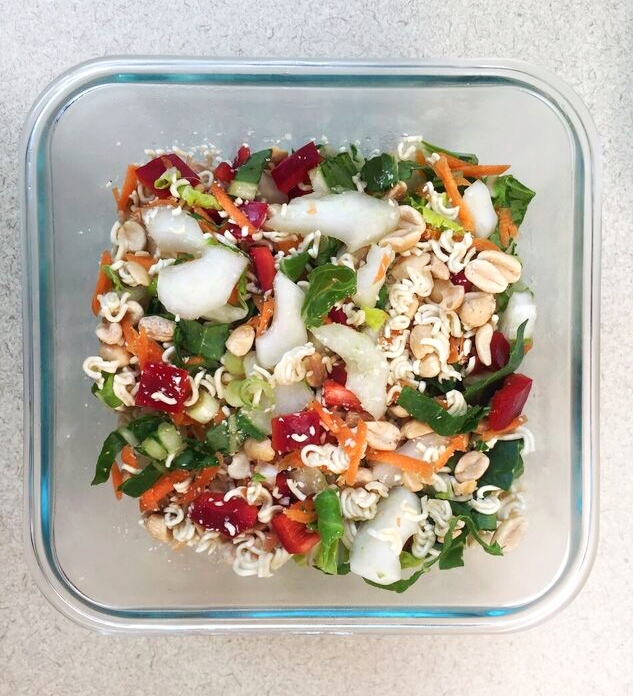 Nearly every ingredient contributes to the crunch factor: bok choy, carrots, red pepper, peanuts, and ramen noodles (uncooked, straight from the package). And the dressing is simple to make with ingredients I nearly always have on hand like peanut butter, curry powder, and soy sauce. It’s one of Jeff’s favorites and he requests it often. I’m pretty sure we’ve been making it every summer for 15 years since it was originally published. It’s that good, and it lends itself well to protein on top, like baked tempeh or a frozen breaded vegetarian chicken patty. Yes, I’m that blogger. I’m recommending one of my own recipes in a round-up. This was inspired by a salad I had at a local restaurant and it is a genius (their genius, not mine) mixture of tastes and textures. The original recipe calls for candied walnuts but I had some house-made crème brûlée almonds on hand from a local cheese shop that stood in quite nicely. Each bite provides sweet and salty and crunchy and chewy and salad, which makes for a nice summer evening meal. 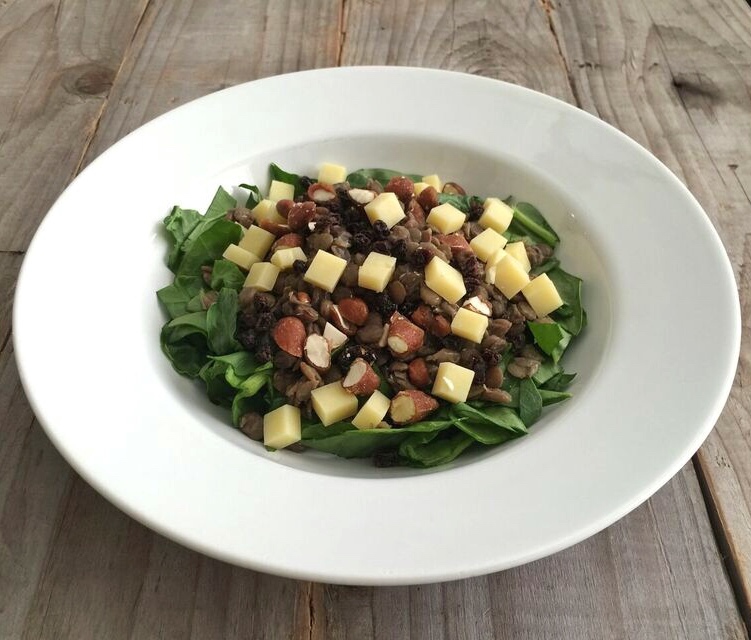 The protein content comes in at 25 grams with contributions from the lentils, white cheddar, and nuts. Not bad for no meat. Look at that. Five favorite salads and not a lettuce in the bunch. Salad really means so much more, doesn’t it? The good news is you don’t have to be vegetarian to enjoy a big bowl of veggies. Anyone can chop it and dress it and have a cool dinner on a hot summer night. Have you been relying on a steady stream of cut up veggies this summer? What’s one of your favorite combinations? If 5 isn’t enough for you, I’ve got another short list of 3 main dish summer salads all under 450 calories, all of which we still make regularly.